These days nutrition is a complicated subject. Are carbs good or bad? Which type of fats should you eat? What is Vitamin D and where can you find it? Eating used to be intuitive but that’s not the case in today’s modern world. A Holistic Nutritionist can help you make sense of the complicated food environment. Using personalized nutrition and a whole foods approach, a Holistic Nutritionist takes into account your unique needs and lifestyle. They look at factors surrounding food choice such as sleep, stress, and mood, to develop an individualized plan to help you reach your goals. There is no one size fits all dietary approach, that’s why our Nutritionist will sort through the evidence and figure out what’s going to work for you! During the initial assessment the Nutritionist will delve into your main health goals and your motivation behind achieving them. You’ll discuss factors that affect your health such as sleep, stress level, exercise, and general disposition. During the appointment you and the Nutritionist will also discuss relevant medical history, digestive function, and your average food intake (including when you eat and what you eat). In order to develop a plan you love the Nutritionist will also find out what foods you enjoy, and which ones you dislike. Our philosophy is small, sustainable changes. That’s why during your first visit you’ll leave with a few key takeaways and an action plan for what your work with the Nutritionist will look like going forward. At follow-up visits you’ll receive more pieces such as recipe ideas or a meal plan, and lifestyle skills like exercise ideas, or techniques like mindful eating, meditation, gratitude or breath work. Together, you’ll develop short-term and long-term goals and start building momentum towards achieving them. The Nutritionist is your coach to identify what needs to be done to reach your goals, break things down into manageable parts, and then help you access the energy and motivation you need to succeed. H eather is a Registered Holistic Nutritionist trained by the Canadian School of Natural Nutrition. 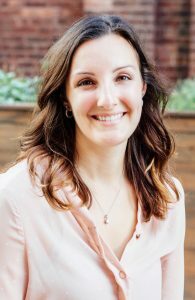 She is also a certified Yoga Instructor and has a Masters of Science in Public Health, and a Bachelor’s of Science in Kinesiology both from the University of Waterloo. Heather specializes in personalized nutrition using live, natural, and whole foods and looks at many factors surrounding food choice such as stress, sleep, mood, and lifestyle. She has a strong background in mental health and is passionate about promoting its connection to nutrition. Heather sees clients who are overworked, overstressed, and overtired, and empowers them to bring their body back into balance. She also specializes in plant-based diets, being vegan herself since 2013. In her spare time, you can find her scouring dog parks for animals to pet, or searching for the city’s best smoothie! Check out Heather’s blog for articles about health and nutrition https://heatherlillico.com/blog or follow her on Instagram http://instagram.com/heather_lil.